For the Most Delicious—and Healthiest—Pregnancy Fuel! As a trained chef, Tara Mataraza Desmond knows how to cook—and eat. But when she became pregnant, all bets were off, and seemingly all food was suspect. Deli meat, raw milk cheese, and alcohol were out, but what is in? Lists of “verboten” foods were easy to find, but healthful, doable meals that would appeal to a pregnant woman’s finicky appetite and also feed her baby in the best way were not. Relying on prenatal vitamins didn’t sound very satisfying for this ambitious cook, who is most at ease in front of the stove. So with registered dietitian Shirley Fan, Desmond put together delicious, healthy recipes with the baby bump in mind. Sections include “What to Eat When You Don’t Want to Eat,” for that queasy and crucial first trimester, while the six chapters of recipes are accompanied by nutritional facts and bonus info to take you through all nine months (and beyond). An Iced Coffee Thickshake and a slice of Nectarine Pecan Baked Oatmeal can start the morning off right, while the Trail Mix Bars are perfect for a pick-me-up snack. Options like Cranberry Pistachio Salad with Chive Vinaigrette, Pork and Peanut Noodles, and Butternut Ragù Lasagna (which does double-duty as a great freezer-friendly meal for after the baby arrives) fill out lunch and dinner. All of the recipes even benefit the post-pregnancy bod (and feed the rest of the family) by focusing on whole foods that deliver flavor without too much fat, sugar, and empty calories that make baby weight hard to shed. 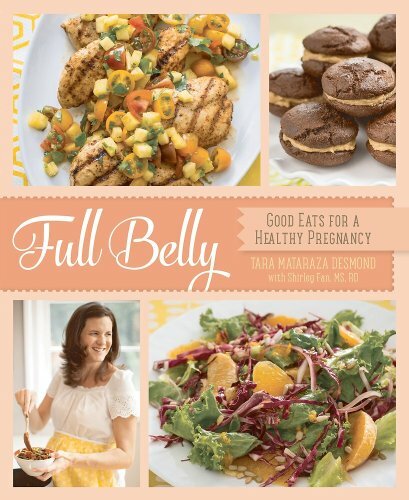 Full Belly is a cookbook designed to foster a healthy, happy pregnancy—but you’ll be coming back to the delicious recipes long after baby arrives!